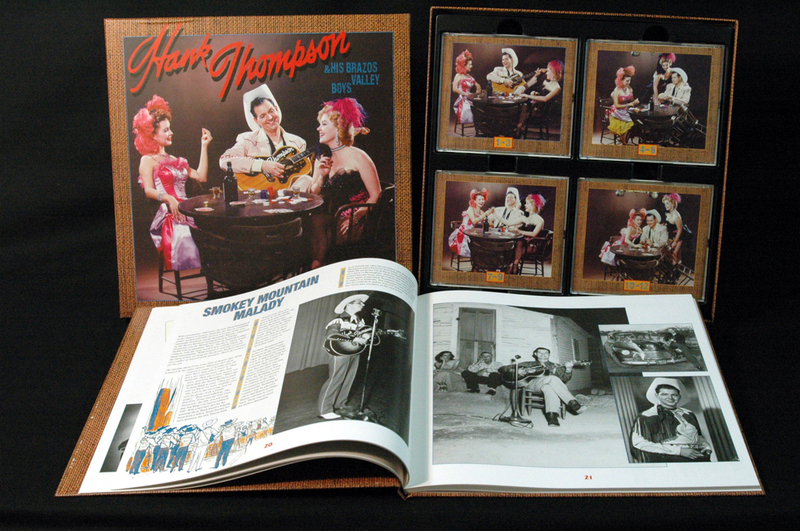 12-CD box (LP-size) with 84-page hardcover book, 329 tracks. Playing time approx. 856 mns. 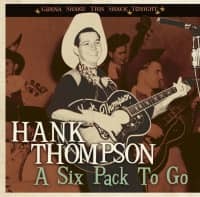 Copies of the 1996 Hank Thompson box have been changing hands for up to Dollar 500 on auction sites! That's good news if you want it and you have five hundred spare dollars...but now there's good news for everyone else who didn't get it upon release. In the course of cleaning house, we found 500 books for the box . So we're re-pressing 500 copies of the box to go with the book. First come, first served. Don't wait and decide you want it after the price has gone back to Dollar 500! 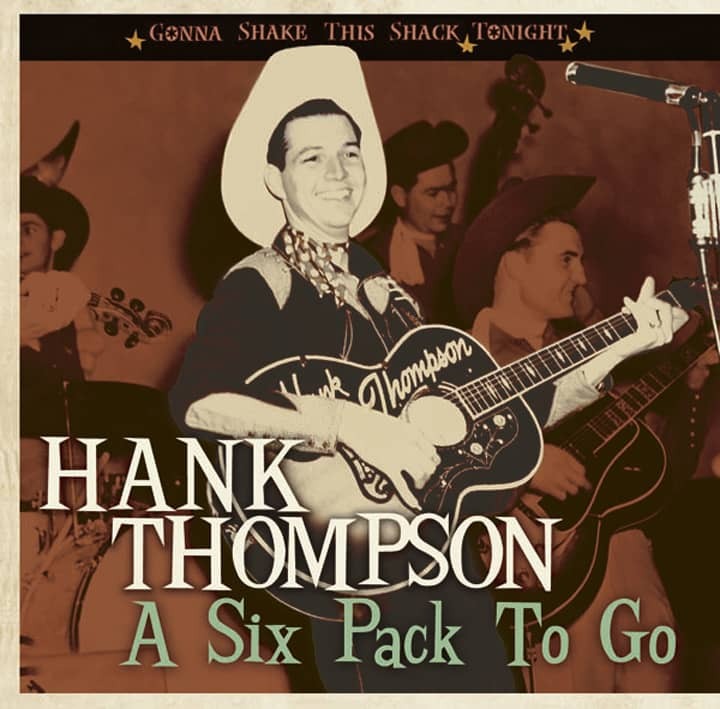 Hank Thompson began his career singing Ernest Tubb-style honky tonk, the sound heard on his first small-label regional hits. Signed to Capitol in 1947, national hits came quickly, and E.T. himself got Hank on the Opry in 1949. Realizing he wanted something different, Hank quit, headed home to Texas and organized a dynamic, Western Swing version of his Brazos Valley Boys band, led by Billy Gray. Not only did they put a danceable sound behind Hank's honky tonk vocals (a formula George Strait repeated 30 years later), they reflected a highly successful convergence of the two related Texas genres. The results were landmark hits like The Wild Side Of Life, Rub-A-Dub-Dub, Wake Up, Irene, Honky Tonk Girl, Wildwood Flower and Squaws Along The Yukon. Along with Hank's ebullient voice, came steel guitar virtuosity from Lefty Nason (the man who created the distinctive Thompson steel sound), Curly Chalker, Bobby Garrett and Bobbie White can be heard. So can brillant fiddling from Curly Lewis, Keith Coleman and Billy Armstrong, with guitar picking from Hank's friend Merle Travis and, on occasion Joe Maphis. 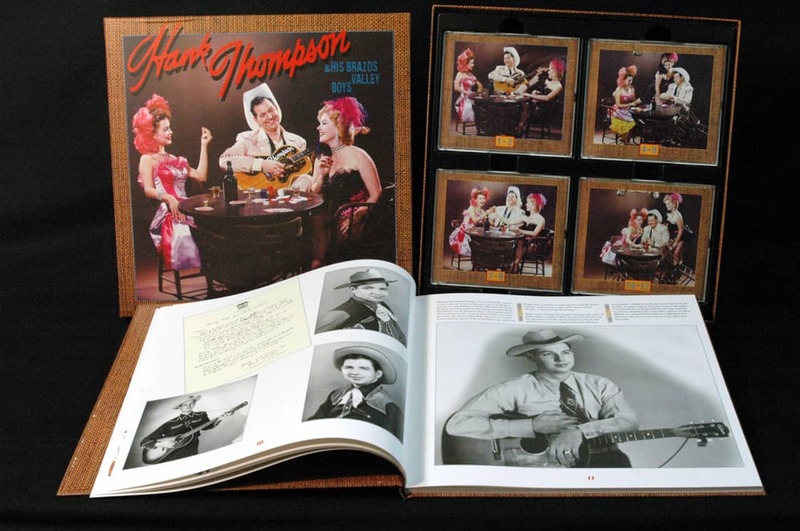 This 12-CD set includes all of Thompson's 1946-47 Globe and Bluebonnet recordings, as well as his complete 1947-1964 Capitol recorded output. 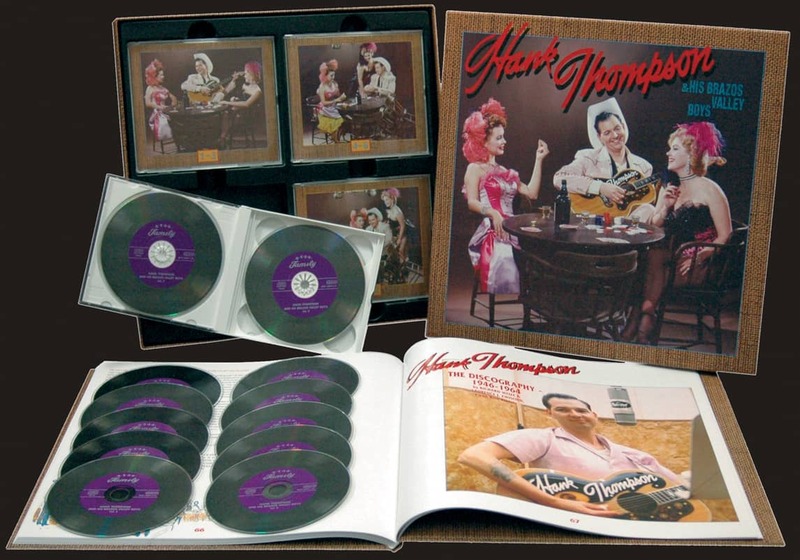 Included are all three of his live LPs including the 1961 ‘Hank Thompson At The Golden Nugget', the first live LP ever done by a solo country singer. Also included is an 84-page hardcover with rare photos and memorabilia from Thompson's own archives, a complete discography and a newly-researched biography by Rich Kienzle. 05 May I Sleep In Your Barn Tonight Mister? 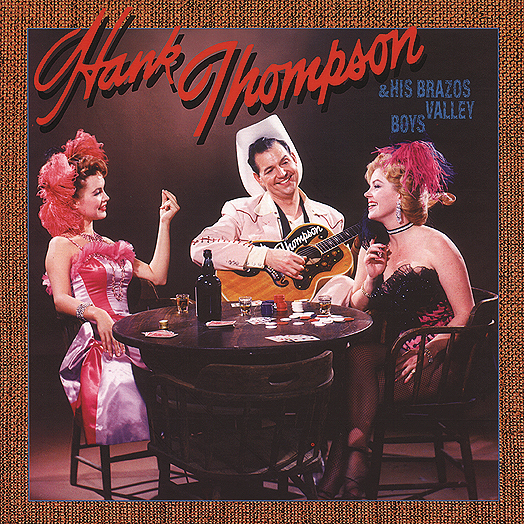 Everything about Hank Thompson was modern. He was one of the first country singers to record on audio tape, the first to record a live album. For years, he flew his own plane to shows. Sick of dealing with crappy dancehall sound systems, he designed and built his own. Handed a coveted membership in the Grand Ole Opry in 1949, soured by the low pay and Nashville's musical conservatism, he quickly went back to his native Texas. Actually, the Waco-born Thompson grew up favoring Gene Autry, the Carter Family, Vernon Dalhart, Jimmie Rodgers, Ernest Tubb and the Opry over the locally generated Western Swing of the Light Crust Doughboys and Milton Brown. After he got his first guitar in 1935 at age ten, his singing won so many amateur shows at the Waco Theater that by the time he was in high school, WACO gave him a Monday-Friday morning radio show as 'Hank The Hired Hand.' He did the final broadcast in January, 1943, the morning he left for the Navy. Home in 1946, studying toward a degree (and career) in electronics, he began playing Tubb-influenced honky tonk with his new band, the Brazos Valley Boys. By fall, he had his first regional hit, Whoa Sailor, on the local Globe label. A year later, after opening for Tex Ritter in Waco, Ritter recommended Hank to Capitol where Humpty Dumpty Heart became his first national hit in 1948. Quick to adapt to changing realities, and aiming at the dancehall circuit, Hank directed guitarist Billy Gray to reinvent the Brazos Valley Boys as a danceable Western Swing-influenced outfit, minus the jazzy instrumental solos he never cared for. Dissatisfied with the small crowds he drew performing around Dallas, he relocated to Oklahoma City in 1951, by then boasting a sound as identifiable as Lefty Frizzell's or Ray Price's. He was blending his jovial honky tonk vocals with swing-flavored accompaniment. The band's high standards earned them awards for over a decade. From 1953 on, his buddy Merle Travis played on nearly all Hank's sessions and on a good many tours. Hank's way with a ballad was apparent on his biggest hit, his 1952 cover of Jimmie Heap's The Wild Side Of Life, which inspired the answer song, It Wasn't God Who Made Honky Tonk Angels (Kitty Wells's first hit). He further demonstrated his ballad skills on I'll Sign My Heart Away and other numbers. Nonetheless, he made his reputation on upbeat bounces like Wake Up Irene, Rub-A-Dub-Dub, A Fooler A Faker, Honky Tonk Girl and A Six Pack To Go. His hits helped keep the Western Swing sound alive during the '50s and '60s when it was largely out of favor. Jim Halsey, who became Hank's manager in 1952, brought new ideas to the table like Hank's longtime relationship with Falstaff Beer in a day when corporate sponsorship of country acts was rare. 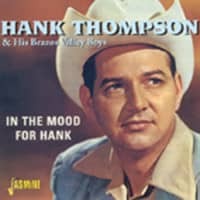 Halsey suggested Capitol record Hank onstage at the Golden Nugget in Vegas in 1961—making him the first country artist to record a live album. Hank parted ways with Capitol in 1964. After two years with Warner Bros., he spent 13 years with Dot/MCA, recording in Nashville. The Dot era brought a few major hits. Nonetheless, while reflecting on his recording career in the book accompanying Bear Family's Thompson box set, he concluded, "I’d play one of those Dot records then drop one of those old Capitols on, and it was all the difference in the world between the presence and quality of the Capitols and what Dot put out." The Country Music Hall Of Fame inducted him in 1989. Hank, who settled in Keller, Texas, northwest of Dallas, remained on the road, performing with local bands after dissolving the Brazos Valley Boys. His later albums included 1997’s 'Hank Thompson And Friends,'an underpromoted all-star effort on Curb, and HighTone's far superior 'Seven Decades,' released in 2000. Like fellow Hall of Famer Porter Wagoner, he literally continued until the end. At times, he'd appear with the Brazos Valley Boys, who'd reformed as an independent band, and billed more recent shows as part of his 'Sunset Tour.' He headlined a show back in Waco on October 8, 2007, proclaimed by Texas' governor as 'Hank Thompson Day.' Late that month, doctors discovered fast-moving, terminal lung cancer. He announced his retirement November 4; two days later, he was gone. In lieu of a funeral, friends and fans assembled at Billy Bob's Texas in Fort Worth on November 14 to celebrate his remarkable life and career. In 2008, Bear Family will release a 33 track Thompson collection as part of its 'Gonna Shake This Shack Tonight' series. 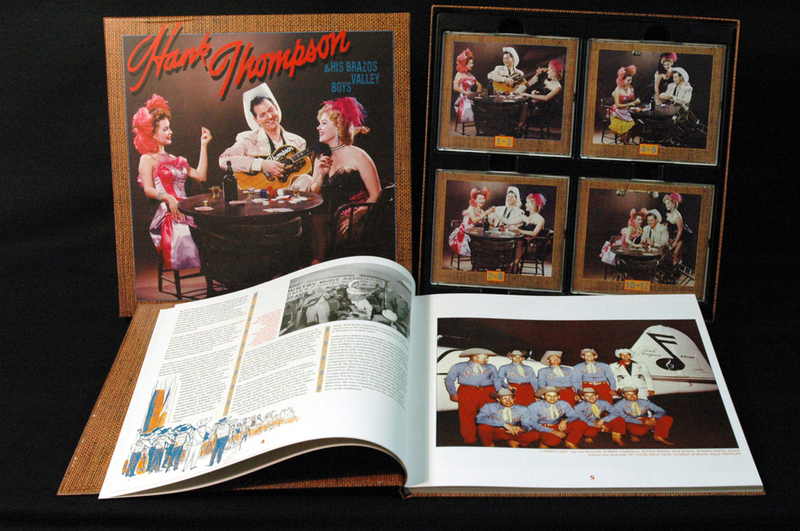 Customer evaluation for "And His Brazos Valley Boys (12-CD)"
Very nicely put together, superb remastering and the book is fantastic; a bunch of info and rare photos in it. Expensive but well worth the price! Das Box Set war ist jeden Cent wert !